South of Bangkok, hugging the Gulf of Thailand, is the province of Samut Prakan — home to the capital's international airport, the ancient city of Muang Boran and sadly the Samutprakarn Crocodile Farm & Zoo. It is here that elephants are forced to perform daily to almost non-existent crowds. One of them, a female who is so skinny and malnourished we've nicknamed her "Bones." Bones caught the eye of the world when a video of her performing tricks to an empty stadium went public. First, she balances herself on two wooden tables before walking slowly over to another area where she precariously walks a "tightrope" made of two steel bars. A wooden table nor metal rods should be able to withstand the weight of such an enormous animal, but Bones is so skinny the trick is much more easy to perform. In fact, if you look in the video, you can see her spine, pelvic bone and shoulders protruding from her skin. It's a heartbreaking sight. And to think that she probably does this each and every day. When confronted, a park spokesman assured that all of the park's elephants were "good." But one look at poor Bones and you know that isn't the truth. She and the other elephants must be rescued from this park and given a new life in a proper elephant sanctuary. Asking anything less is to allow them to continue to suffer. 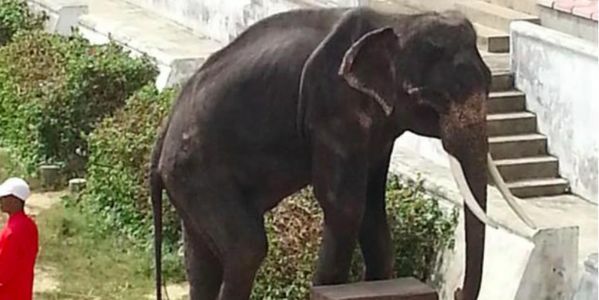 Please sign the petition and demand that the Samutprakarn Crocodile Farm & Zoo give Bones and the other elephants to a reputable sanctuary. Our petition is working.Officials have forced the zoo to give their elephants a break from performances. But that isn’t enough. They should be given to an elephant sanctuary. Keep the pressure on Thai officials. Share this petition with at least THREE of your friends.